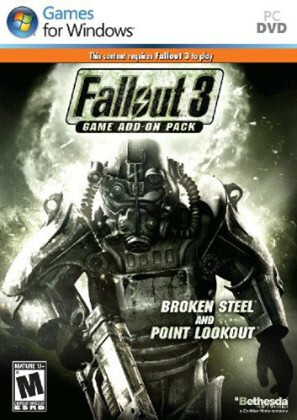 Broken Steel is the third downloadable content (DLC) pack for Fallout 3, following in the footsteps of Operation: Anchorage and The Pitt, which must have sold well, given that Bethesda has already announced plans for two additional DLC packs. The new content starts up two weeks after the events of the main campaign. You're miraculously not dead (this isn't explained, but if Colonel Autumn can survive the purifier radiation, then I guess you can, too), and you quickly learn that not only has the Enclave survived the events from the end of the game, they've gained control of an orbital missile platform, which allows them to strike at any location at any time. That means you have to shake off your wounds and take the fight back to them. The Broken Steel campaign consists of three main quests, where you first have to figure out where the Enclave's new base of operations is, and then destroy it. These quests are all linear shoot 'em ups, much like Operation: Anchorage, except that the enemies are much tougher, and so it's more fun to play through them. There are also three side quests, all involving the new (aqua pura) being produced by the purifier. These quests aren't linear, and they involve some role-playing, but they're all very short. While the three main quests might take you about 5 hours to complete, the three side quests can be completed in under an hour, and so they feel kind of insignificant. I would have preferred a little more balance between the two. Broken Steel also increases the level cap from 20 to 30. This sounds like a great idea, and it's certainly nice to gain experience again, but I don't think Bethesda really handled the addition well. The character system was designed for 20 levels, and all Bethesda did was tack on 10 new levels, and so there's hardly any balance. A good character system forces you to make choices, but now with 30 levels you can easily max out every skill and attribute and have a (perfect) character. What fun is that? What Bethesda should have done was playtest the original campaign better and adjust the experience gains to prevent players from hitting the level cap halfway through the game. But failing that, when adding 10 new levels, they should have adjusted the character system (for example, by increasing the maximum skill level from 100 to 150 or 200) so there's still a reason to gain levels. Finally, Broken Steel also adds in a bunch of new equipment, enemies, perks, and achievements. These additions are a mixed bag. Some of them are nice and some of them are a waste. For example, the new enemies, including the albino radscorpion and the super-mutant overlord, are all tough, and they can appear anywhere in the game. This is a nice addition because starting around level 15 in the original campaign, all of the combat got pretty easy, but now your character can be challenged again -- and maybe even get killed. On the downside, almost all of the 15 new perks are worthless. Three of them are for changing your alignment (why bother? ); another allows you to learn all of the schematics in the game (how lazy can you get? ); and still another removes the withdrawal effects from alcohol addiction (is anyone even drinking the booze in the game?). I gained six levels while playing the new content, and I didn't pick any of the new perks. Overall, Broken Steel is a better value than either of the previous two DLC packs. It contains about the same amount of new content, as far as quests and items are concerned, but then it also adds in support for a higher level cap. I wasn't thrilled with either addition, but they're nice enough, and combined they make the Broken Steel DLC pack worthwhile.